OXFORD, Miss. 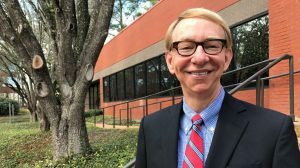 – Dennis Moore, whose career in journalism has led him back to Jackson as co-editor of Mississippi Today, has been tapped as this year’s Samuel Talbert Silver Em recipient by the Meek School of Journalism and New Media at the University of Mississippi. The award, named for an early department chairman and leader in journalism education, is the most prestigious journalism honor the university bestows. Moore is the 58th honoree in the recognition limited to native Mississippians or journalists who have spent a significant part of their careers in the state. Selection is based on careers exemplifying the highest ideals of American journalism. Moore began his reporting career after graduation at The Clarion-Ledger, but his experience started earlier at The Germantown News in Germantown, Tennessee. He went, worked and learned. More experience was gained through an internship with Southern Living magazine. In Jackson, Moore, a movie fan, was allowed an extra assignment to write one review per week. When the city landed the International Ballet Competition, he was assigned to provide coverage, gaining more exposure and experience to writing about the arts and entertainment. His success took him to The Orlando Sentinel to direct its arts coverage and edit the newspaper’s award-winning Sunday magazine, Florida. USA Today was next, and Moore advanced to managing editor of the Life section. In that role, he traveled and routinely met with celebrities, including forming a real admiration for Steven Spielberg and being nervous before talking with Mick Jagger. He was also pleased when John Grisham reported that his mother had appreciated a story Moore had written about the author. Moore lists his interview with Octavia Spencer, who won an Oscar for her work in “The Help” as his favorite actor interview. An abrupt change came when Moore became breaking news editor for USA Today. In that role, he guided the coverage of Ebola in Africa and the United States, the violence and protests in Ferguson, Missouri, the trial of a Boston Marathon bomber and the 50th anniversary of “Bloody Sunday” at the Edmund Pettis Bridge in Selma, Alabama. Moore was with USA Today during the development of its internet presence. In his newest position, he joined Fred Anklam, also a USA Today veteran, previous Silver Em recipient and Ole Miss graduate, in launching an all-digital news service based in the state capital and devoted to nonpartisan reporting on Mississippi issues. Mississippi Today is “true startup from creating a website to hiring reporters to introducing the new concept to readers,” More said. The online publication has seed grants from several national foundations with the purpose of informing the public about education, health, economic growth and culture. The Silver Em presentation will take place during the Best of Meek dinner April 5 in the ballroom of the Inn at Ole Miss. For more information, contact the Meek School at meekschool@olemiss.edu.